Kids map out ecological relationships using orange rope at Arie Crown woods Monday. 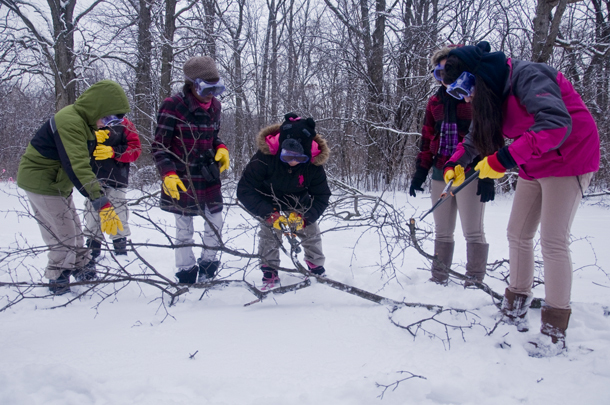 Kids cut up buckthorn, an invasive species. 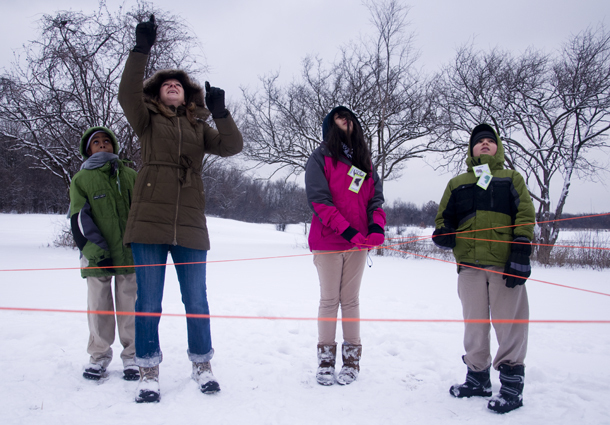 The “web of life” exercise, wherein kids map out ecological relationships using orange rope, is interrupted by the flight of a Cooper’s hawk overhead. Cheryl McGarry of the Forest Preserve District of Cook County, points to the bird. For many children growing up in a metropolis like Chicago, that may be the case. Indeed some communities are consistently deprived easy access to nature. But Chicago’s famous stockyards and steel-framed skyscrapers are not as isolated from Leopold’s land as the city&apos;s middlemen and gadgets might suggest. Twenty years ago, The Nature Conservancy started Mighty Acorns, an environmental education program that introduces Chicagoans to nature when they are young, hoping to recruit (or awaken) life-long stewards of the land. Before they joined the program, for example, some students from the Academy for Global Citizenship, a charter school near Midway airport, might not have know about the rolling hills and forests less than 10 miles down the road at Arie Crown woods in southwest suburban Countryside, Ill.
Monday morning was the fifth graders’ second visit to Arie Crown woods. In just a few hours, the group spotted a coyote and a Cooper’s hawk, as well as plenty of deer tracks in the fresh snow. They also got a crash course in ecological restoration, learning to identify and clear buckthorn, an invasive species that crowds out native oaks. “That’s the best kind of education: getting out and experiencing things,” said Ruth Jetton, a teacher whose fifth grade class seemed especially adept at reading animal tracks — and initiating the occasional snowball fight. Teachers who once turned to textbooks for far-flung environmental case studies now teach sustainability from Chicago’s backyard. Other exercises focused on adaptation and interdependence. Students mocked up a “web of life,” donning nametags like “mushroom,” “mouse,” and “hawk,” and then literally stringing out the relationships of their adopted identities using orange rope. The Forest Preserve District of Cook County serves the most children per year of the two dozen partner organizations that make up the Mighty Acorns consortium. The environmental challenges that these kids will face are incredibly complex, inherently political and potentially very costly. So an awareness of nature and basic ecology is only the beginning of a real environmental education. But an early connection to the land can set the stage for lifelong growth, teachers say. Congress even gave this idea a vote of confidence in 1990 by passing the National Environmental Education Act. And Aldo Leopold knew the value of education, too.